A key part of NCF’s business plan is making sure that their customers see them as one BIG company, with small company attention and service. And the Universal Office is vital to presenting that image. “We want folks to look at us like one of the big boys, but we don’t want to get things tangled up too much. Our Business Office service does that real easy. Everyone has his or her own number under the one big central number. So repeat callers can get the driver they want if they already know him. If they don’t care, the calls come to me and I send them on to the next guy in rotation. 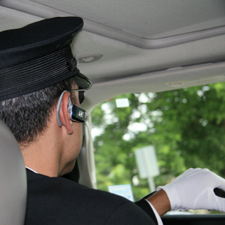 “Sometimes, we get a call for two or three cars at the same time for some big event. Used to be I had to call down the list until I found who could take it. And it seems like I always missed someone or ticked someone off - ‘Why dincha call ME?,’ he says. ‘I DID,” I says, and we’re off from there. No more’a that, let me tell you. “A couple of weeks ago, I had one of my regulars, a big Insurance guy from Boston, coming in to town and needed four cars for some big party he was throwing. So now, I just send out one message to everyone, ‘I need four cars for Friday at 3 in the afternoon - first come first served,’ and it’s done. I had him covered in an hour. “The Universal Office makes getting paid easy too. I just use the Virtual Merchant part of it to put in the credit card charges. Then as soon as the stuff has cleared, I move the fee for each driver to his or her GenieCard Account - minus my own small service fee of course. Hey, I did put this thing together, after all!